This week’s Tuesdays with Dorie recipe was Double-Crusted Blueberry Pie (courtesy of Amy of South in Your Mouth, where you can find the recipe). I don’t like blueberry pie (or any other kind of fruit pie), but the rest of my family loves it. And I don’t like rolling out pie crust. So I delegated this one to #1 Son, who loves both making pie and eating it. We have our nicest meal of the week on Fridays, our secular version of a Shabbat dinner, and that’s usually the only dessert we eat all week. So the blueberries for the pie had to come from the supermaket rather than the Saturday farmers market, but at least they were Jersey berries. #1 Son had enough pie crust left to make me a miniature pie in an oval ramekin; he used chocolate chips, pecans, and shredded coconut (sweetened this time), held together by my homemade chocolate syrup. He’s a lovely boy. So when the blueberry pie was served, #1 Son said “Oh good God.” Husband and #2 Son just said “mmmmmmmmm”; their mouths were too full to speak. The crust was beautifully flaky, and my mini pie was delicious. All in all, another successful Dorie dessert. Update: I just want to clarify something here, because a lot of the comments seem to be under the mistaken impression that #1 Son helps in the kitchen: he doesn’t. He cooks whole meals (and whole pies) by himself. He didn’t just roll the dough — he made the whole pie, plus the mini one for me. Technically, I suppose, this should be his post, but I stole it! He’s 16, but he’s been cooking since he was 10 or 11, and #2 Son, who is 11 now, is following in his footsteps — he makes killer scrambled eggs. It’s amazing what kids can learn to do when they want a particular food badly enough! Flags courtesy of #2 Son. Happy Fourth of July! This entry was posted Tuesday, July 8th, 2008 at 8:57 am	and is filed under Uncategorized. You can leave a response, or trackback from your own site. How nice to have someone to roll out the pie dough for you! And I love the mix that went into the mini pie. I love the little flaga on the top. What a great pie. Haha I love that your son rolled out the dough! 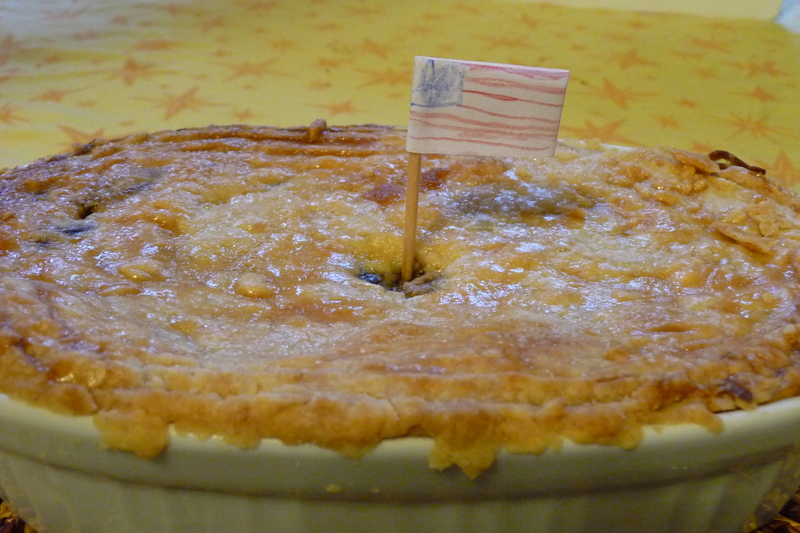 The pie looks fantastic, and I love the little flags! I’m glad it was well received, it looks wonderful! Great job and welcome to the group! That is so nice of you to make a pie you don’t want to eat!! and it looks so sute with the flags! That mini pie sounds heavenly! Gotta love Jersey berries! Great looking pie! Yum! The pie looks great! Delegation is a good thing, isn’t it? The pie looks terrific! I love that your kids help with the cooking. So awesome! Looks like he did an incredible job! How funny!! Great story. And what a good son #1 is for doing the rolling of the dough. How fantastic that your sons get in the kitchen and assist you! It makes me so happy to hear of a teenager who cooks and bakes pies. That’s awesome. That’s so awesome. Tell him he’s awesome for me, would you? It looks great. Isn’t it wonderful to have someone, especially a 16 year old guy, bake for you. Great looking dessert. Your son did a great job! I hope my kids are that helpful in the kitchen when they are older! 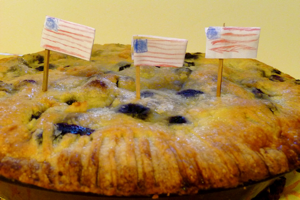 your pie is so cute, love the flags…!! and i agree with the others, a teenager who wants to be domestic..so fab. some lucky gal in the future will thank you! Nice looking pie! My only question, do they do the dishes as well? Well, #2 Son unloads the dishwasher every morning, occasionally without being reminded. #1 Son assiduously avoids anything that looks like kitchen cleanup (although he does do all the family laundry). Life is a series of trade-offs!